Wounds fester and spread in the darkness of silence. The swirling reds, oranges, and yellows of fall’s foliage dance alongside Mary-Elizabeth Briscoe like flames as she tears through the winding back roads of the Northeast Kingdom, Vermont. Desperate to outrun memories that flood her mind, no matter how hard she rolls her motorcycle’s throttle, she cannot escape them. Shut down and disconnected, Briscoe has lived her life in silence in order to stay alive. Her grief is buried, and shame is the skin that wraps around her bones—but then, following the brutal murder of a local teacher, she is forced as a grief counselor to face her lifetime of unresolved sorrow. Will she finally be able to crack the hard edges of her heart and allow in the light of truth so real healing can occur? Mary-Elizabeth Briscoe is a licensed mental health counselor currently on sabbatical from her private psychotherapy practice in northeastern Vermont. She currently spends her time between Cape Cod, Vermont, and Ireland. She has a masters degree in clinical mental health counseling from Lesley University and is a licensed clinical mental health counselor and a Certified Trauma Professional. She has been a lecturer for Springfield College School of Professional and Continuing Studies St. Johnsbury, Vermont campus. She has contributed to Cape Woman Online and Sweatpants and Coffee magazine. This is her first book. I love memoirs, because I love to peek into other people’s lives, but I often feel weird reviewing them, because in a way, reviewing a memoir is like passing judgement on the writer’s life, rather than just their book. In this case, I didn’t have that problem, because Mary-Elizabeth Briscoe’s memoir The First Signs of April, is so well written it feels like reading a novel. 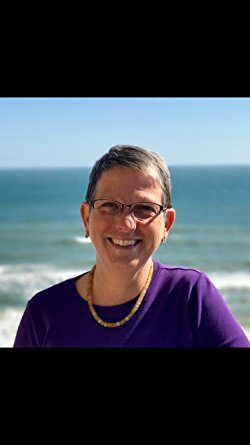 Her descriptions are vivid and realistic – I felt like I was on her motorcycle with her, or walking her dog, or any number of other places – and her voice is one of wit and candor mixed with hard-won self-awareness. I really appreciated the way Briscoe alternated chapters set in the ‘present’ of her memoir – 2014 – with chapters in 2000 and 1982. It really felt cinematic experiencing her story that way, her growing up/coming of age, her early adulthood, and her more contemporary self, and it’s that juxtaposition that really made this book more than just a memoir, but something truly special. True, there are some very dark moment in Briscoe’s story. There is blood and loss and heartache. 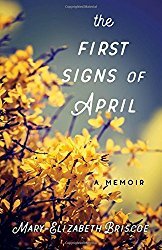 Overall, though, I believe that this memoir has a note of hope running through it. Goes well with sharp cheddar, fresh bread, and a nice red wine.